The work was composed in 1976 and belongs to the indestructible category of "music for pleasure", orientated on traditional patterns. "Music for pleasure" signifies, no doubt, music which does not claim that there is something "behind" or even "under" it. The number of movements, five, reminds us of the Serenade (the title also puns on Mozart's famous KV 525, originally in five movements). Instead of the central Adagio in the Serenade, the composer here groups typical "wind-characters" around an Intermezzo. The acoustic effect is not least the result of the musical pairings used (three trumpets, three trombones). Hummel frequently exploits imitative polychoral effects implicit in this instrumentation and so adds to the dimension of historical depth. The fourth movement with its title Procession recalls not only this authentic application of wind music but also responsorial chant, the root of polychoral music. In its fading close, it echoes another famous predecessor, the Pilgrims' March from Berlioz' "Harold in Italy". From the pen of Bertold Hummel comes "Eine kleine Blasmusik" / "A Little Wind Music", playing unmistakably on the name of Mozart's "Kleine Nachtmusik" / "Little Night Music" . But musically it is hardly possible to compare the works. 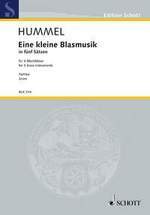 Hummel's composition recalls with its harmonic gestures rather more the pithy fanfare sounds we know from the entrance of the gladiators or the battles of the musketeers, from films with sandals or with cloak-and-dagger action. The work is also rhythmically interesting and was performed with finely graded dynamics and well-chosen tempos.